Are you planning to spend the next holidays exploring the nature? If you answered yes then it is time for you to start getting all the right gears and equipments ready. If you are going to camp then instead of a tent, why not buy a hammock? They are even more comfortable and will give you a better taste of nature than a tent would because you will be sleeping in an elevated position between trees where you can gaze at the stars at night or just feel nature’s beauty all around with your eyes closed. 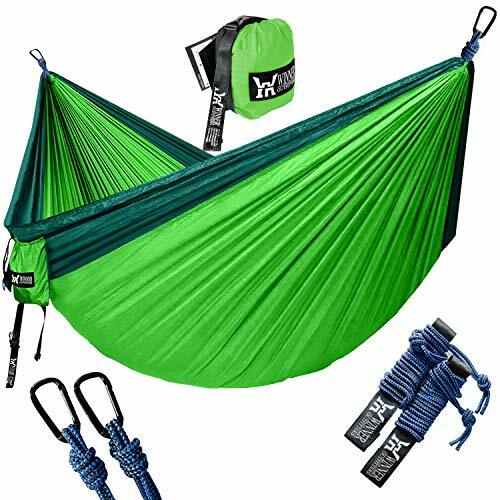 The double sized camping hammock by Winner Outfitters is a strong and comfortable hammock that will turn your outdoor experience into something thrilling and unforgettable. Our full review on the product below will give you more details. Q: Are there any color options? Q: Can it hold more than two people? Q: Can the material handle bad weather and rain? 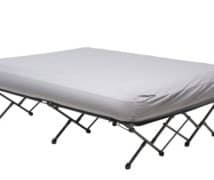 It is made of 210T nylon parachute fabric which makes it extremely strong and durable, allowing you to move about freely while you lay inside without the worry of tear or damage. The material is totally breathable and mildew-resistant which prolongs the life if the hammock. Triple locked stitches maximize the strength while providing you with the best hold and safety. It is a large hammock (double size) so you can share it with your loved one at any given time. If you want to spend some quality time with your partner then this is the perfect thing for you. It also serves as an excellent hammock for your kids to share during family camping trips. 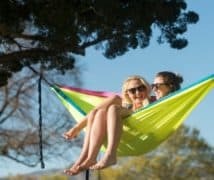 However, we feel all hammocks are good enough for single persons only because having two people inside may seem uncomfortable for both individuals as both will be drawn towards the center. It is okay to just lie down and take a nap but for an overnight sleep, it may not seem too comfortable or practical being squeezed towards the center. This, however, is totally up to personal preference. If you are going to use this hammock alone then you will find some extra material left on the sides which you may choose to use as a cover or just tuck away underneath. It has a weight capacity of 500lbs so two people can relax inside at any given time. It is natural for people who aren’t used to sleeping in hammocks to feel uneasy, especially if the hammock does not appear to be tough enough to carry heavy load but you will immediately feel at ease with the sturdy build of this product and its ability to hold heavy weight. Despite the fact that it is made of such strong and durable material, it is super light to carry around. It comes with a bag in which the hammock fits to reduce carry size so you can take along whenever you wish to go camping, backpacking or hit the beach. If you have a nice backyard you don’t even have to go far to enjoy a thrilling time, just hang the hammock between two tall trees and lay inside while reading a book or taking a nap. It is great hanging anywhere and at any time. The hammock is also very easy to set up and will take you less than 5 minutes to have it ready. 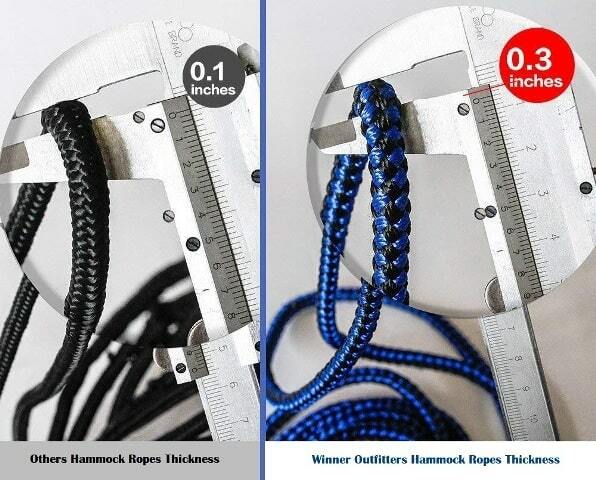 Included are two ropes (they are each 137” in length) two tree straps (52”x1”) and two solid steel carabiners. 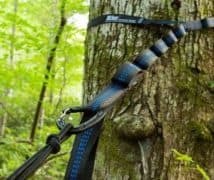 The tree straps are designed to hold your hammock securely without causing any harm to the trees. 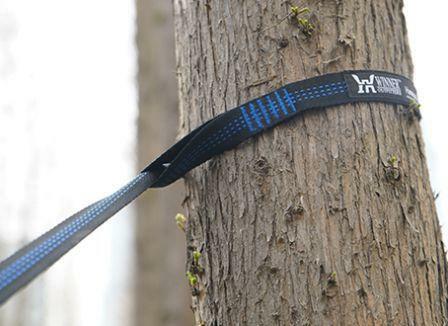 If the tree straps are not friendly enough then there are chances of harming the trees but with these straps, you can rest assured knowing that you are not harming nature in any way. Other objects such as poles or bars can also be used instead of trees if they are present. The carabiners have smooth edges to protect your hammock and ropes and prevent them from being snagged. For even more security the ropes are extra thick and provide a better hold and balance, no matter how much you toss and turn in the hammock. They even come with pre-tied knots to make set up faster and easier. Although the product claims to have a load capacity of 500lbs, there have been complaints of it tearing apart in the middle even while accommodating lesser weight. Ans: Yes. It is available in 4 color styles; each hammock comes in dual colors such as dark green/green, khaki/grey, red/charcoal and sky-blue/blue. Ans: The hammock can hold up to 500lbs so two people can comfortably fit inside. It is large enough to accommodate two people but it is not recommended for 3 or more persons. 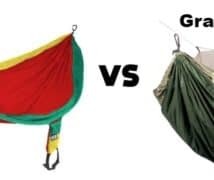 Ans: It is made from 210T nylon parachute fabric so you can expect it to be durable and withstand everyday wear and tear but we do not recommend using this hammock in the rain as it can damage the material. Ans: As this hammock has a large load capacity, it can easily accommodate children and is built with all the necessary safety measures. Make sure it is set up properly to avoid accidents. Well, for starters we love hammocks, just the thought of lying inside a hammock while it sways lightly (like a cradle almost…but, of course, it does not rock at all times) and watching the sky or feeling the fresh air all around are good enough reasons to get us reaching for one but they have other advantages which make them ideal for outdoor activities. The Winner Outfitters Double Camping Hammock is easy to set up and will cost you less than a tent and it is also very portable. While tents can accommodate more people but the hammock provides more thrill and takes you closer to nature. A hammock is a popular camping equipment but even if you are not really planning to go backpacking or camping somewhere far, you can get the same thrill by just hanging this hammock in your backyard. For those who love to read, doing so in a hammock also makes the experience even more fun and unique. This hammock is a perfect getaway to turn all your outdoor events into something exciting and refreshing.